On paper, the prospect is simple enough. Put together two solid heats, and walk away with a floral crown on your head and your name in the history books. 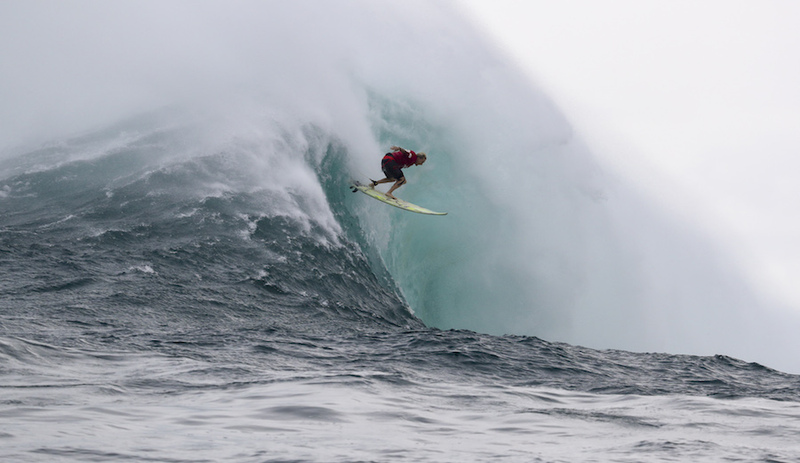 In practice, though, a win at Jaws, in all its bone-crushing fury, might be one of the highest achievements in competitive surfing. As big wave legend Dave Kalama explained this morning from the commentary booth, Nazaré is, without a doubt, the tallest wave on the planet, but there’s no other wave that breaks with the same ferocity as Jaws. Today Keala Kennelly came out on top, and she has the bumps and bruises to prove it. Now in its third year, the women’s event at Jaws did not disappoint. Pe’ahi standout Paige Alms may have been the favorite, but Justine Dupont showed up to blow up in the first semifinal heat, finishing with the top score of a 12.50. From her semifinal heat through to the final, though, Keala Kennelly was absolutely relentless in her willingness to throw herself over heaving ledge after heaving ledge – going over the handlebars twice in the final and skipping down the face. What the event lacked in complete rides, it made up for in absolute commitment as the ladies bounced back from beating after beating. Not to mention getting swept to oblivion by a cleanup set. Kennelly spent the final minutes of the women’s Final on the medic’s boat, having to ditch her board after her leash broke and she had no CO2 left in her safety vest. Kennelly’s win comes just months after the World Surf League announced it would institute equal pay – a move influenced heavily by a push for equal pay at Maverick’s by the Committee for Equity in Women’s Surfing, a group of which Kennelly is a founding member. Under the WSL’s new pay parity policy, female competitors at Jaws will be the first to take away the same prize money as their male counterparts. This story was updated to include comments from Keala Kennelly. Juan Hernandez contributed reporting.